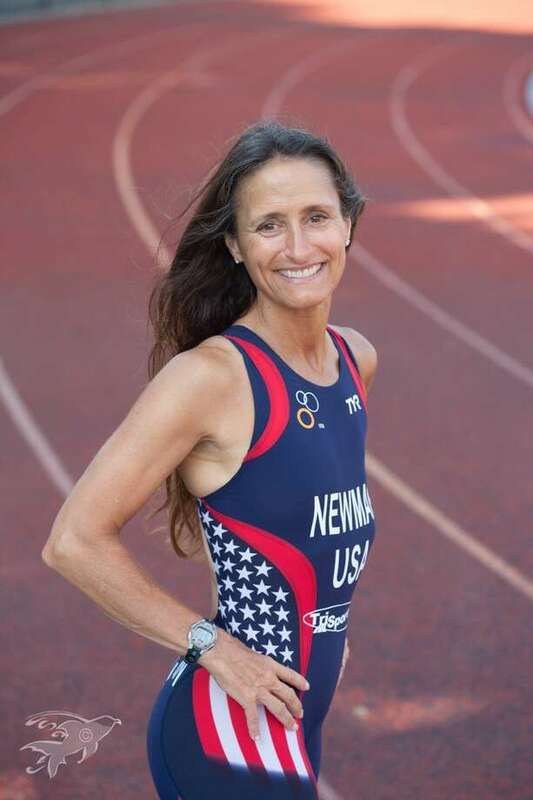 Karen Newman, author, triathlete and cancer survivor, will speak at the 2016 Center for HOPE Luncheon in Darien on May 3. DARIEN — At 51, Karen Newman’s positivity makes it almost difficult to believe the extent to which she has suffered physically and emotionally for much of her life. The Vermont woman stopped at the Darien Center for HOPE on March 18 while in Connecticut promoting her new book, “Just Three Words,” to meet the staff and see the building ahead of her appearance as keynote speaker at the 2016 Center for HOPE Luncheon on May 3 at the Wee Burn Country Club. The world-class triathlete discussed her many successes racing and her troubled past, pausing often to laugh loudly and stopping completely to hug everyone in the room when she was reminded of the significance of the date. Exactly eight years ago, Newman had been diagnosed with stage three breast cancer. Up to the point of her diagnosis, Newman had been afflicted with eating disorders and body issues as a result of bullying. She became anorexic at 14, and shortly after became bulimic. Newman struggled through school with what would later be diagnosed as dyslexia and was often relegated to the “dunce” chair. Newman carried the negative words of her childhood with her into adulthood. She married, had three kids and continued to race triathlons, all the while suffering increasingly from the bulimia that she kept secret from her friends and family. It wasn’t until Newman’s diagnosis in 2008 that she was compelled to make a change. With a new commitment to life, Newman no longer suffered from bulimia following her diagnosis. She began chemotherapy and decided she would compete in the 2008 Age Group Triathlon World Championship in Vancouver, which was to be held in May. “I would be laying on my bed and I would have to tell myself, ‘You’re going to get out of bed, you feel fantastic.’ It might take me a half hour to get to the door, but I would get to the door,” Newman said of the months of training leading up to the race. Because of her insistence on competing, two oncologists refused to treat her. Finally, she found a third doctor willing to compromise, provided that her red and white blood cell counts were in the realm of normalcy. Two months after her diagnosis she boarded a plane only hours after a chemo treatment — making frequent in-flight trips to the bathroom to vomit — and competed in Vancouver, where the conditions were bad enough to cancel all heats starting after Newman’s. In freezing water Newman, suffering from neuropathy as a result of her treatment that numbed her hands, splashed along while other, healthier racers were pulled out of the water for fear of hypothermia. She refused to submit to the conditions and completed the race, finishing second to last and collapsing into the arms of her family and friends as she crossed the finish line. “I have never felt so loved,” Newman said. Still, after her triumph in Vancouver, the cancer spread and her fight intensified. More rounds of chemotherapy ensued, as did surgeries and radiation, leaving Newman exhausted but never defeated. “With cancer the finish line often moves. So you really have to learn to appreciate each day,” she said. Ultimately, Newman beat the cancer and returned to the World Championships in 2011. The following year she set a world record for her age group. Now with “Just Three Words” available on Amazon.com, Newman is focused on sharing her story with others. Tickets for the Center for HOPE Luncheon start at $125. All proceeds will benefit the Center for HOPE and the Den for Grieving Kids. For more information or to purchase, visit familycenters.org.